As the largest democracy in Latin America and the fourth largest democracy in the world, the Brazilian government represents over 208 million constituents. 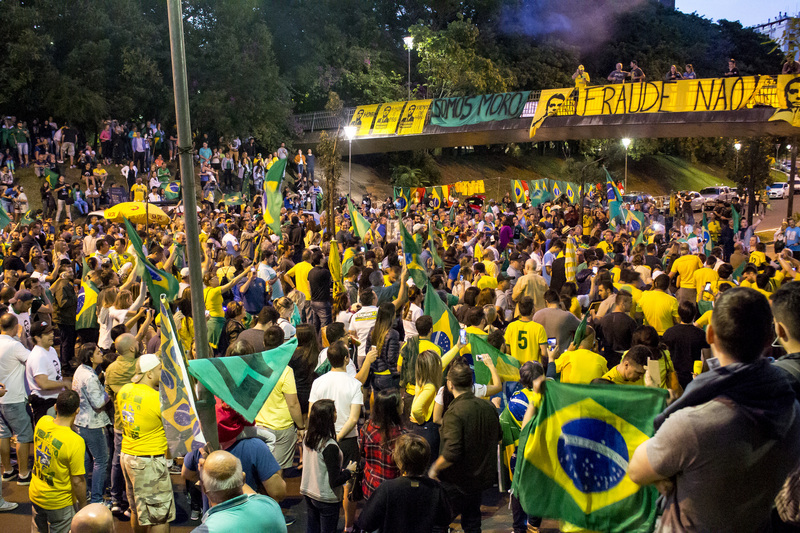 In a nation in the process of rebuilding after economic collapse and political turmoil, the elections set an important precedent for the future of Brazil. This is reflected in the high-stake events of the election season, with rampant protests on both sides of the political spectrum, increased voter turnout and, most intensely, the stabbing of president-elect Jair Bolsonaro. Bolsonaro’s victory over the left-wing Workers’ Party of Brazil’s candidate, Fernando Haddad, has sent waves through the nation. With the victory of Bolsonaro, a congressman representing the Social Liberal Party (PSL), it appears that Brazil has shifted dramatically to the right. This success was not limited to the executive office, where Bolsonaro cleanly swept 55.1% of the vote. Haddad’s Workers’ Party witnessed a staggering 13 seat loss in the Brazilian Chamber of Deputies and a six seat loss in the Senate. On the other hand, Bolsonaro’s Social Liberal Party garnered a massive 44 Chamber seats (35 more seats than the next most popular party) and four Senatorial positions. These wins become increasingly confounding considering that the PSL has never held more than one spot in the Chamber of Deputies and has never held a Senate seat since being founded in 1994. In contrast, the Workers’ Party is an institutional behemoth in Brazil and retained executive authority from 2003 to 2016 under former presidents Dilma Rousseff and Luiz Inácio Lula da Silva. The Party hasn’t held less than 59 Chamber seats since 1998. So, given these drastic changes, what explains this sudden emergence of the Social Liberal Party? And what explains the downfall of the Workers’ Party of Brazil? To understand the collapse of the Workers’ Party, the legacies of its leaders, such as Dilma Rousseff, Inácio Lula da Silva, and João Vaccari Neto, cannot be understated. For years, the Brazilian government has been plagued with corruption, a topic that the Brazilian public is certainly invested in. For example, the 2013 Confederation Cup Riots and the violence of the 2016 impeachment riots, both of which centred around corruption-based complaints, had massive turnouts. Given that these issues have crescendoed in importance, the 2018 elections provided the perfect setting to levy corruption-based complaints. Unfortunately for the Workers’ Party, these complaints were directly tied to them. Former President Dilma Rousseff was impeached in 2016 due to a number of scandals, with the most pressing concerning corruption and abuse of Brazilian budgeting laws. Rousseff has essentially transferred her own corruption-laden image and unpopularity to the Workers’ Party. Rousseff is not the only Workers’ Party member implicated in corruption scandals. João Vaccari Neto, Rousseff’s Secretary of Finance, and former president Inácio Lula da Silva were convicted in connection with Operation Car Wash, a high-level corruption scandal involving bribery, money laundering, and misuse of government funds. Additionally, corruption charges led to the arrest of Lula da Silva, commonly known as Lula, the Workers’ Party Presidential candidate for the 2018 elections. His arrest left the Workers’ Party unable to find an appropriate replacement candidate. Part of Bolsonaro’s victory was his ability to paint himself as removed from the scandals of previous political eras. Utilizing the “drain the swamp” rhetoric that populism entails, Bolsonaro depicted himself as outside of politics and consequently unmarred by corruption. Given the isolation of the PSL from the corruption of the 2014-2016 government (the party held only a single spot in the Chamber of Deputies), what could have be perceived as a lack of political experience actually served to Bolsonaro’s advantage and led him to success. Another reason for the PSL’s surge in popularity is that, compared to Haddad, the PSL’s political policies diverged significantly from the unpopular status quo which Haddad adhered to. For example, one of the most prominent concerns of the 2018 elections was crime and security. Over the past three years, Brazil has witnessed an unparalleled increase in crime, including an annual 6.8% increase in the national homicide rate. This rise in crime has had economic ramifications as well, as both the public and private sectors have dedicated roughly 76 billion Brazilian real (roughly 27 billion CAD) to crime management and alleviation. Bolsonaro’s success correlates directly with the fact that he has made crime management a central focus of his campaign, promising a relaxation of gun restrictions and harsher sentencing laws for those convicted. But beyond just making crime management a key platform, Bolsonaro and his party have adopted most robust and severe policies, allowing them to stand out against more moderate politicians. Conversely, Haddad’s platform focused on restricting access to guns and lessening drug-based sentences. Haddad has lambasted the Brazilian prison-complex for criminalizing drug possession with the claim that, if decriminalized, the overburdened prison and justice system would run more efficiently. However, Haddad’s softer approach scared voters away. Many voters, especially those in urban areas, view restricting gun access as instrumental to ending gun-based crime. In rural areas, where gun ownership is more culturally ingrained, voters worried that a restriction on guns would leave them unable to defend themselves and leave them more vulnerable to rising crime rates. Similarly, while international organizations have criticized an increase in drug sentencing, Bolsonaro successfully portrayed the ties between drug use and crime, frightening Brazilian constituents away from Haddad’s more liberal policies. Finally, the results of the Brazilian elections cannot be discussed without evaluating Bolsonaro’s campaign strategies. Bolsonaro has amassed global notoriety for his Trumpian ways, gaining him massive, albeit polarizing, media attention. For example, Bolsonaro has adopted a bombastic Twitter personality, a “Brazil first” rhetoric, and has been aided by Donald Trump’s former political advisor, Steve Bannon. However divisive, Bolsonaro’s antics made him recognizable, a key area in which Haddad failed. In a mid-September poll, a staggering 1/3 of Brazilian voters did not know who Fernando Haddad was, with even less understanding the specifics of his leftist platform. This was because, despite being an electoral finalist, Haddad was relatively new to the campaign trail following Lula’s arrest and disqualification earlier this year. Haddad’s main struggle has been maintaining popularity among Lula’s base, despite, frankly, not being Lula. Lula, despite his corruption charges, has maintained a prominent following, having left office with a 90% approval rating. Coming to the election scene rather late, with limited federal involvement (Haddad’s leading political accomplishment is being mayor of São Paulo), Haddad fails where Bolsonaro succeeds — in prominence. All in all, Bolsanro’s win, and the general triumph of the Social Liberal Party, was not surprising. Going into the primaries with 46.03% of the October 7th vote, an impressive 16% above Haddad, Bolsonaro was a mere 4% away from winning even without the second round of voting. Following the conservative waves witnessed in the United States, England, and France, it is understandable that the 2018 Brazilian elections resulted in conservative victory. But what does the PSL victory mean for Brazil? To some, it represents change: a shift from the Workers’ Party, from corruption, from a leftist federal government. But to others, it represents the exact opposite: a return to the old. With Bolsonaro having gone on record praising the brutal military dictatorships of the 1970s and 1980s in Brazil, many fear the PSL will push Brazil back to a time of torture and repression. But either way, only time will tell. Feature image by Nícolas Chidem for Editorial J, via Flickr Creative Commons.